The Snyder Center for Aphasia Life Enhancement (SCALE) is a community-treatment center for people with aphasia and their families. SCALE is a specialty program of The League for People with Disabilities, a non-profit organization committed to offering individuals with a wide range of disabilities the opportunity to gain independence, increase self-sufficiency, and improve their quality of life. 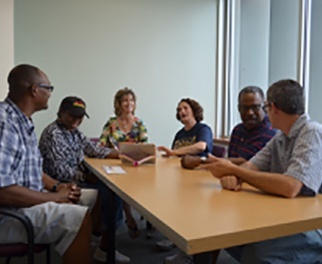 SCALE is Maryland’s only aphasia center offering full-day programming, four days per week. This intensive, long-term treatment program offers over 60 groups a week utilizing the Life Participation Approach to Aphasia (LPAA). Members (individuals with aphasia) attend between 5-16 hours per week. Thanks to the founding Snyder family and the League, this LPAA program has provided long-term services for over 150 individuals with aphasia since opening in 2008. SCALE class offerings fall into two main categories: 1) language-based classes, which focus on reading, writing, speaking and listening, and 2) activity-based groups such as art, music, greenhouse, and exercise. Language classes may be theme-based, with topics centered around travel and current events, or communication and skill-based groups that focus on conversation, strategies, and reading. Members select four classes per day, based on their goals and interests, and attend the classes weekly for an extended period. Speech-language pathologists facilitate language-based classes, and SCALE’s recreational therapist/yoga instructor leads the activity-based sessions. Group members determine the content and structure of each class; groups are member-driven and are modified based on their input and feedback. The Center also empowers members and families to participate in SCALE and the aphasia community at large. 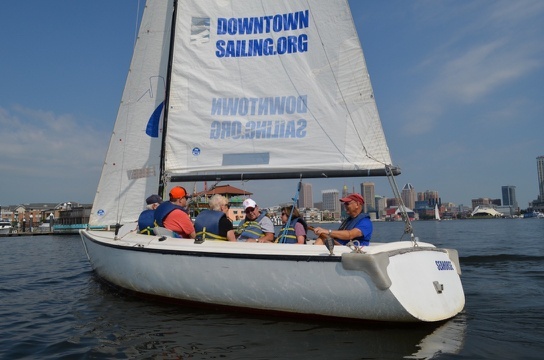 They offer a number of social opportunities, including camping at the League’s Camp Greentop, partnering with other non-profit organizations, such as Downtown Sailing to go sailing together, attending an annual Orioles game, and hosting musicians and parties at the Center. SCALE’s peer-mentoring program, facilitated by Judy Crane, a stroke-survivor with aphasia, focuses on pairing SCALE members to teach and support one another as they participate in the community. The program includes activities such as planning parties and outings, and organizing events with the wider community like attending health fairs and local support groups to advocate and educate others about aphasia. 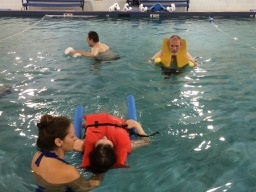 In addition to the great programming available at SCALE, members have access to a state-of-the art wellness gym and therapeutic pool as part of a specialty program of the The League’s Medical Day Program. Nursing oversight, counseling, and rehabilitation services are also available to members. For more information on SCALE, visit The League for People with Disabilities website. Click here for a collection of YouTube videos from SCALE.